Artists are increasingly addressing issues. Rancière's Relational Aesthetics vision almost seemed to be fading from view but is now being realised at what seems to be an exponential rate. No doubt the magnitude and all-encompassing nature of pressing issues like climate change are sidelining almost any other focus or conceptual base. If the ship is going down maybe formalist manipulation or inward contemplation could equate with arranging deckchairs. Mike Singe’s exhibition addresses climate change as well but more as a means of investigating the ways in which we eagerly adopt ideological positions, moral high grounds and futile courses of action in response to it. This work is less about the issue than it is about how we respond and where and why we choose to place our faith and our hopes. As Singe writes: 'The work is more concerned about the resultant cultural change; the impact it has on our behaviour and the strange objects / ‘cultural’ artefacts it inspires’. It’s about how we come to believe, how we derive the evidential, from a range of diverse and often conflicting sets of data. The production of one plastic bottle of water consumes three bottles of water; the hybrid car is powered partly by electricity generated by fossil fuel. The equation is never a neat one. The impetus to believe is elegantly and efficiently interrogated in this exhibition and always with humour and elegance. 'Divine Intervention' consists of a row of texts, key theological/religious texts, placed in a line with small lights above them. Each is connected to one of a row of tiny wind-powered generators on the exterior of the Gallery. The power generated lights up one text or another in a random fashion due to slight accidental differences in the position or the mechanics of the system’s components. This elegant translation of ‘seeing the light’ is subtly applied to either the Koran, the Bible, or the utterings of Ron L. Hubbard. There’s also a democracy in the equivalence of the texts which causes us to consider that the bonkers ranting of Hubbard may be no less bonkers than the book of Mormon or the Bible. All of this allusive connection is made with such a spare economy of means it hits with an insistent and subtle force. A complete lack of the didactic assures us that these propositions are made with a polite conviction which is at once witty and playful as well as providing serious space to consider the often arbitrary ways that we arrive at a position. 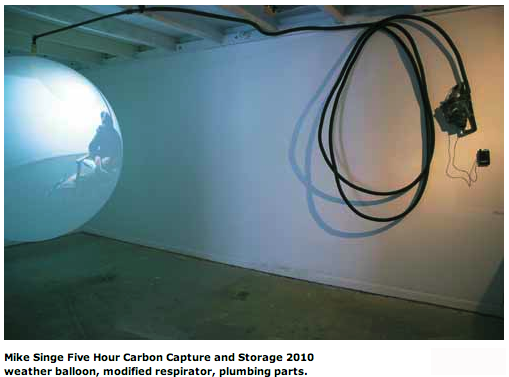 'Five Hours of carbon capture and storage' is a durational performance work in which the artist dons a respirator attached to a large balloon. His expirations are collected in the balloon as a reservoir for his personal carbon emissions. Video documentation of this is projected onto the filled balloon in the gallery space. We see the balloon growing over 15 minutes projected on the balloon itself to the soundtrack of the artist’s breathing. The apparatus is impressive while the resultant capture of carbon is miniscule and this suggests the ultimate futility of many potential strategies for carbon capture while it celebrates the moral value of the tiny individual effort. 'Perpetual Surrender' consists of a solar-powered white ‘flag’ mounted on a steel rod and topped by a small propeller which pivots in front of a solar cell which drives the propeller. The power is never enough to turn the rod in a complete revolution. There is a palpable sense of frustration as the flag moves further across the arc yet never gets beyond a certain point because it is in fact interfering with itself by blocking light to the cell exactly when it needs the power most. It remains ‘impotent’ and can never get out of its own way. The strength of this show is in its spare elegance and wit, the lightness of touch and the clarity of the beautifully crafted mechanisms through which the often futile, oxymoronic and arbitrary mechanisms of ideological positioning produce received ‘wisdom’ and ultimately, uncontested ‘truths’.